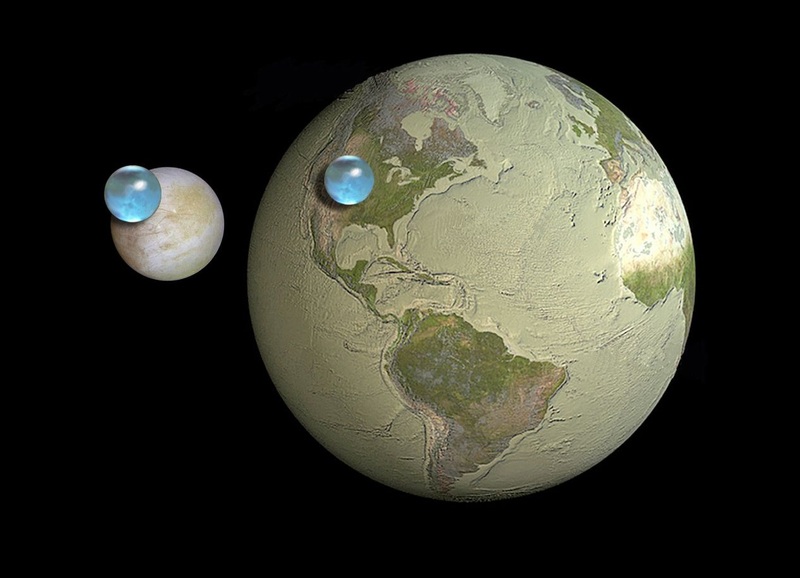 If Europa were our moon, would we have a water world teeming with alien life just next door? 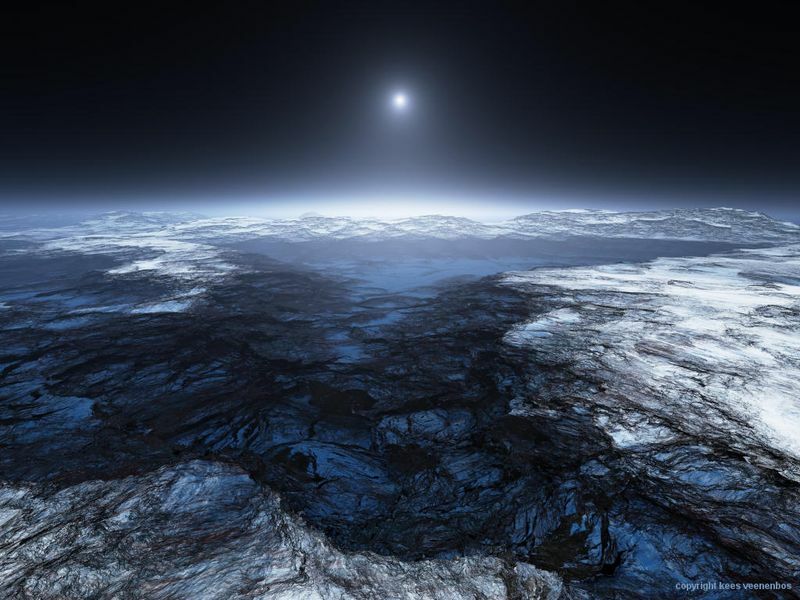 Europa is a frozen moon, so at first glace, it doesn’t seem like a great candidate for life. However, the thick icy crust hides a sub-glacial ocean. We know about this oceanic wonderland because, among other things, we detected its magnetic field (however, of course, we won’t be 100% sure until we get there). Ultimately, the scientific consensus is that Europa has a liquid ocean due to gravitational interactions between itself and the other bodies in its neighborhood. In short, Jupiter (and a few of its large moons, such as Io, Callisto, and Ganymede) pull and tug on Europa, causing the moon to stretch and contract. Without these gravitational interactions, and the heating that they produce, Europa would be a solid ice moon. But what if our moon was replaced with Europa? Would we have a majestic water world just next door? This should go without saying, but thought experiments require estimates and guesstimates. It is important to note that some of these processes can happen on short time scales (days to months), like the formation of a thin atmosphere, or long time scales (tens of thousands to tens of millions of years), like moon-wide glacial melting. The amount of time depends on a number of factors, and the following is a hypothesis based on our best current data. Now, all that said, Europa is currently located beyond the habitable zone in our solar system. As a refresher, the “habitable zone” is the region where liquid water can exist (this zone is defined according to the temperature of the planet’s star). So, if Europa were moved and placed next to Earth, the moon would suddenly find itself within the habitable zone, and it would start to melt. Due to the lacking atmosphere around the moon (it has one, but it is tenuous and very thin), the ice transitions straight from a solid to a gas. Soon, Europa would begin to have a thicker and more substantial atmosphere, which would slowly grow thicker and thicker. Ultimately, without any protection of a magnetic field, strong ionizing radiation (what’s causing the ice to melt) would break apart the water in the atmosphere, leaving behind hydrogen and oxygen gasses. And the ionizing photons have another impact on Europa—they create a temporary protective magnetic field! This is what we currently see around Venus and Mars (to a lesser degree). The solar wind interacts with Venus’ atmosphere, ionizing it, stripping it away, but also creating a temporary magnetic field in the process. This temporary magnetic field deflects some of the solar wind, thus slowing down the stripping process. For a time, a fine balance would be found between the amount of ionizing radiation and the strength of the magnetic field. So things would look promising…for a time. Glorious water world? Well, not quite. At first glance, all of this sounds like a fantastic thing, it appears as if Europa will completely melt, leaving behind an oxygen rich water world. But this wouldn’t last. Without a geomagnetic field like that of the Earth or Jupiter, it is doomed. It’s atmosphere would slowly be stripped away. Look familiar? Europa is now a small and barren rock orbiting around the Earth; it has become a smaller moon than our current one, as all of its water has been lost to space. What started off as a giant cosmic ice block has melted and gradually been stripped away by the solar wind (alas). What makes Europa such a nice target to explore is precisely its location beyond the habitable zone. When the planets were forming in our solar system, there was the frost line at about 5 AU, this is the point at which objects are far enough from the sun that ice crystals could begin forming. An icy moon the size of Europa could not form around the Earth, and it couldn’t continue being an icy moon if it was moved here. It’s too warm and the moon is too small. This same principle applies for a moon like Titan. It is able to exist with its methane lakes because it’s in a cold region of the solar system. If it was closer, it would be too warm for the hydrocarbons to form naturally. Moreover, if it were closer to the sun, it would have had most of its atmosphere stripped away. So to sum, it’s very unlikely that a habitable moon can form around an Earth-sized planet located in the habitable zone. The moon would have to be substantially larger, making it more like two planets as opposed to a planet/moon. Additional commentary provided by Jolene Creighton.